You're here looking for upper back pain exercise because, like me, you probably feel pain and tension after working all day possibly even on your computer for most of the day. That pain you are feeling may be due to a few things. Let's review them below. Even as a Pilates Instructor I admit it... I get lazy at times, tired, and start slouching. It's much easier to let ourselves go until we start feeling that pain and tension in our upper back and neck. One of my favorite exercises to stretch and strengthen the muscles of the upper back and neck is the Pilates upper back pain exercise shown to the right. Lying on your stomach with your hands clasped high on your back lift your upper body off the mat reaching your arms up towards the ceiling and down towards the end of the mat at the same time. Inhale to lift and hold, then exhale to lower back down. Repeat this for 4-6 repetitions. You can also do this exercise standing, however you won't get the upper back strength work only the stretch. Check out this article for ways to improve your posture and strengthen your upper back. Your work space set up may be contributing to your upper back pain. Is your chair the right height? Too high or low may contribute to your slouching or straining to look up. Find an adjustable chair and play with the height until you are comfortable and without pain. It's time to sit up straight, push your bottom up against the back of the chair and stack your shoulders up over your hips and ears over your shoulders. Use a pillow if you need more support for your lower back. Is your computer screen too high? Your screen should be set up just below eye level for optimum height and distance about 12 inches away. What about your keyboard and mouse? When I rest my hand on the keyboard I start to feel tension. Allow your fingers to work on the keyboard keeping your wrists and forearms straight and parallel to the floor. When you use the mouse, set your hand down and move the mouse with your wrist not the whole arm. Find out how you can strengthen you shoulders and upper back with exercises from my shoulder ebook here. The Bruegger Relief Position is another of my favorites when working on the computer to relieve upper back pain and tension. Position: Sitting on the end of your computer chair with your feet flat and arms down palms turned out. 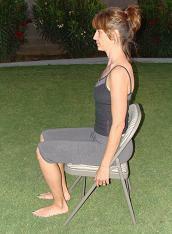 Inhale as you press your hands back openning the chest and bringing your shoulder blades toward your spine. Exhale to release. Do this 4-5 times and as often as you need to do upper back pain exercise for relief. 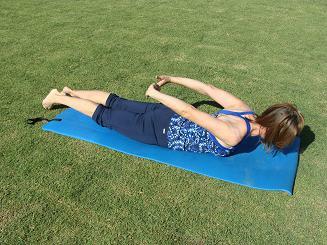 See this exercise performed on the Pilates Chair just below. Standing or sitting with good posture place one hand at the back of your head and lift that elbow as you reach the other hand down your side to the floor. Move straight sideways exhaling as you reach down, inhale as you come back up to start. Repeat for 4-6 times on each side. Working on pulling exercises for upper back pain are some of the best ways to strengthen the upper back and shoulders. 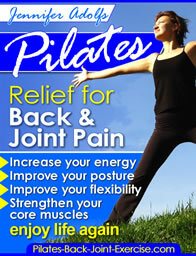 Leave upper back pain exercise and find more ways that Pilates can help you have a happy and strong back.